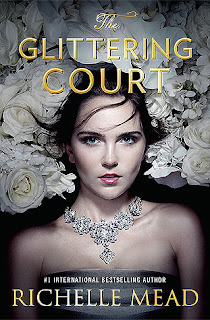 Synopsis (via Goodreads): Big and sweeping, spanning from the refined palaces of Osfrid to the gold dust and untamed forests of Adoria, The Glittering Court tells the story of Adelaide, an Osfridian countess who poses as her servant to escape an arranged marriage and start a new life in Adoria, the New World. But to do that, she must join the Glittering Court. I love the Vampire Academy series, but I haven't read anything else by Richelle Mead until now. I just couldn't pass this up when it became available as an audiobook at my library. The cover is stunning! It also goes well with the story, which is a bonus. I hate when a cover has absolutely nothing to do with a book. There are various settings for this book, which I enjoyed, but that also means there is a lot of background being given. That made this book feel like a longer read (or in my case a longer listen, hah), which I was completely okay with. I never felt like I was being bogged down with information, or that the pace of the story was lagging. Despite this, there are certain aspects of the story that remain shrouded in mystery. It was a little frustrating at first, but I later learned that it was because Tamsin and Mira would get their own books, which would explain their stories as they happened alongside Adelaide's. There are quite a few things that I need to know, but I guess that was Mead's intention. I'll have to read the other two books to learn their secrets. I was thinking this book would be a little more fantastical, but it wasn't. It was very practical while also being incredibly engaging. I don't know why I felt compelled to listen to it nonstop, but I did. There's just something about it that hooked me from the beginning. The characters weren't annoying or unbelievable. I felt like I was listening to something that actually happened. They tried to do what was best for themselves, and in the end *highlight to view spoiler» it ended up being each other. Cedric did love her enough to let her go. He tried to find a husband for her that she wouldn't hate being married to, and she was willing to commit forgery to help him. I'm really happy that things worked out for them in the end. It wasn't perfect, and the journey was messy, but things could have been a lot worse. Yeah. This is how I felt about the Vampire Academy books so now I’m a little more excited to try this one. I still want to read her Dark Swan series! I've heard good things about the Georgina Kincaid series, too. Have you read either of those? I haven't read anything by this author, but I'm glad you've liked her books so far! It's the best when a book can grip you like that, and it's a good sign when a book is so realistic that it feels like you're reading about something that actually happened! You haven't?! Please, please read the Vampire Academy series! You read a lot of vampire books, so I don't know how you missed these!